"....a face to meet the faces....": Good day....! 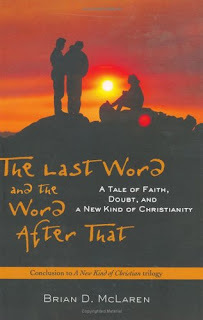 I have just finished 'The last word and the word after that' by Brian McLaren. It's 'creative non-fiction' - an academic/theological exploration of something dressed up in a novel. Dan Poole, is a pastor under 'investigation' by his church because he seems to be preaching liberal theology from the pulpit of his (increasingly) conservative church. His character is used to explore various ideas about God's character, about mission and about hell. I knew the 'eternal fires type hell' to be a human construct, built by Dante and others rather than biblical writers. But I didn't know that 'hell' wasn't really a concept at all for the Jewish people until very late. Establishing themselves as God's people in the here and now, in this world, was their only concern for a very long time. If my understanding of what McLaren says is right, an 'afterlife' concept of hell was later adopted for very pragmatic reasons. The Jews were persecuted. And yet they knew themselves to be God's people. Two difficult facts to reconcile. So, the question: 'why aren't things as they should be for us?' was answered: 'because somebody must be screwing it up.' Who? For the zealots, the people screwing it up were those Jews who submitted to Roman authority. The zealots wanted to fight back - to bring Israel's God back to power in battle. For the Essenes, the 'screw-ups' were the people who were too politically involved in fighting the powers and authorities of the physical world. The key to uplifting Israel was focus on the spiritual life, on God's law, etc, in detachment from 'worldy' things. For the Pharisees, the scapegoats were 'sinners': people not keeping God's laws. So, in a sense, they developed a theory whereby those who didn't follow God's rules were destined for 'hell'. If they would only clean-up their act, the world would become perfect. Hence new and more detailed interpretations of God's laws became an obsession. When Jesus came, he did indeed speak of a place like hell (in picture language and parable, and in such a way that we cannot possibly pin his meaning down). At least part of his intention in speaking of it was to turn the Pharisees' and others' misconceptions of 'hell' on their head. His purpose was very definitely not to drive fear into sinners and the marginalised. In theory, none of this surprises me. But I am struck again by how pervasive is the theory 'a Christian's task is to save the unchurched from hell'. This can only lead to judgmental behaviour, to an overemphasis on a future world we can never understand and to incredibly patronising 'evangelism'. Churches are there to usher God's perfect kingdom in and, yes, to introduce people to him. But the motivation for that is that life is immeasurably more empty without God, not because they'll go to hell after death. The bible does very clearly indicate that we will all face God's judgement, and that everything about us will be revealed at that time. But the emphasis is (I think) always on the 'process' of judgement. What happens afterwards is described in poetic, metaphorical, terms. McLaren's book showed me again the reason I want to 'do stuff' in churches. I believe there is as much of a mission field inside the church as outside it. My passion is to help people who call themselves Christian to see how wonderful God is and how their understandings of him limit and demean him. And I include myself there. McLaren begins: I believe that God is good. No thought I have ever had of God is better than God actually is." Amen! Perhaps there's an awful lot of deconstruction work to be done before Christian communities will allow God, in all his fulness, into their midst. And perhaps, when they manage to do that, God's kingdom will really be upon us. Let's get to it, I say. Amen to that! All the more reason why you should persevere within the church. The world needs people like Anna in positions of influence. Great post Anna. I read the book last year and loved it, just what I needed at the time - and quite refreshing to think that when Jesus used the term "Hell" he was turning it's meaning upside down to those who would use it as a battering ram - one of many reasons I love Jesus! Also, love the humbleness which you describe limiting God - me too. If you quite enjoyed the McLaren book, I'd also recommend two others of his - "Generous Orthodoxy" and "the Secret Message of Jesus" - both fairly life-changing for me, in completely different ways. The Secret Message has a lot more "kingdom" theology in it - which is more where I am at the moment. It's all good. Just wanted to add my enthusiasm for McLaren. Life-changing series of books for me.